Sorry I haven’t posted more reviews lately. It’s been a whirlwind getting ready for my daughter’s first birthday! Needless to say, it’s been a crazy few weeks juggling my day job, my fatherly duties, and my night job of bourbon. I had always been skeptical of the Dickel 17 story. I had always thought they were trying to be clever with the marketing. I thought to myself, “There’s no way they just lost barrels for 17 years in a rick-house… Aren’t those barrels taxed?”. Who would have guessed that all along I just needed my new friend Brian from George Dickel to set me straight?! I would like to publicly thank him for giving me the first explanation for the mix-up that finally made sense. 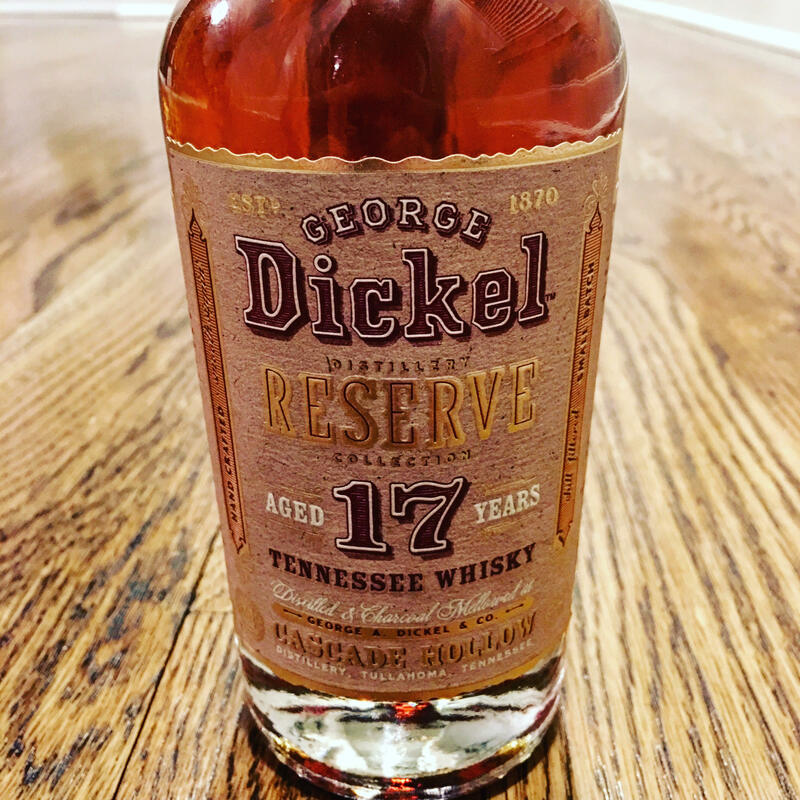 Dickel 17 originated as George Dickel Barrel Select Whisky. For those of you that don’t know, the Barrel Select is hand selected by their distiller and is typically aged anywhere from 10-12 years. This particular batch of whisky, sat atop a hill at the distillery for many years. Dickel had opened a rick-house on their tour that patrons could go into (they can’t go into all of them) and that rick-house is on the bottom of the hill, a stone’s throw from when you exit the distilling building on the tour. What had happened, was that this batch of whisky was moved from the rick-house on the top of the hill to the one on the bottom of the hill. When it was checked in, it was entered as new barrels instead of previously aged barrels. So now you see it all makes sense! These barrels were still taxed, but just entered as they had not been previously aged. By the time someone caught the mistake, they had been aged for 17 years… This is a perfectly plausible explanation! FINALLY! So now that we’ve got that out of the way, onto the juice! In full disclosure, I have to admit I have always had a soft spot for the George Dickel Distillery. Perhaps it’s because it used to be “Cascade Bourbon” and can trace its history back to the O.F.C. Distillery, what is now known as Buffalo Trace. It had been moved to Kentucky to O.F.C. once prohibition hit Tennessee. In later years, the brand was moved back to Tennessee, partly to directly compete with another known Tennessee brand a few exits up Interstate 65. Knowing what I know now about this whisky, it makes me enjoy it in a whole new light. On first sniff, I definitely get an aroma of oak, spice, fruit, and maybe caramel. The drink itself is very smooth, which I would not doubt for a 17 year aged whisky. Also at 87 proof, it is a lighter drink than some of the others you may see out there. I can only describe the taste as oaky blueberry pancakes with just a hint of spice. This is definitely a unique and enjoyable drink! So what’s the final verdict? I’d tell you that if you had the extra cash, you should definitely Buy It. However, it’s increasingly hard to find in stores, but they do have some available at the distillery. At $80 for a 375ml, it is hard to justify the purchase, but, like I said, if you can swing it, it’s a great whisky with an interesting story and a memorable taste. Don’t wait though, there were only 80 barrels of the Dickel 17 and it has been out for a while. If you don’t want to pay the $80, you at least have to Sip It because DICKEL’S FOR DRINKIN!